Bill Burton‘s pro-Obama SuperPAC Priorities USA Action sent out a memo Thursday morning, in support of their “Romney’s Gold” Olympic ad, which points to ABC News’ reporting on Republican presidential candidate Mitt Romney‘s 2002 Winter Olympics, and some of those games’ memorabilia that was manufactured outside the US. Most symbolically damaging to Romney is the fact that lapel pins featuring his likeness were made in China, a literal badge of the Obama campaign’s outsourcing attacks. It is no surprise Mitt Romney dodged questions last week on US Olympic uniforms made in China since Romney himself outsourced Olympics products to China, Bangladesh and Taiwan when he ran the Salt Lake City Games. As ABC News reports, Romney even had a pin with his own face on it produced in China. Priorities USA Action may have to change our new ad to include the countries where Romney outsourced production of Olympics materials. As a corporate buyout executive, head of the Olympics, and Governor, Mitt Romney repeatedly outsourced American jobs to places like China and India. As President, Romney’s policies would encourage even more outsourcing of American jobs overseas. Like the uniforms in 2012 and in 2002, when Mitt Romney ran the Salt Lake Olympics much of its official memorabilia was manufactured overseas, including a 9/11 commemorative pin and another fashioned in the shape of Romney’s head. Salt Lake 2002 Olympics paraphernalia obtained by ABC bears “Made in China” and “Made in Bangladesh” stamps. 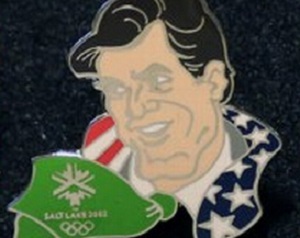 Far stranger than the fact that the pins were manufactured in China is the USOC’s decision to market a pin that featured Mitt Romney looking like an extra from an episode of The Funky Phantom. Nothing captures the thrill of Olympic competition like a Hanna-Barbera commemorative executive pin. We’ve found no mention of the memorabilia by Romney, a businessman brought in to save the Olympics from scandal and fiscal peril, but he did address the notion of cutting costs by buying from China in another area of Olympic organizing. When Romney’s Salt Lake Organizing Committee developed the Gateway plaza in Salt Lake City, offering patrons and residents the chance to buy bricks for $100 and have their names inscribed, the committee used granite bricks from China, despite an abundance of granite in the nearby Wasatch mountains, the Salt Lake Tribune reported at the time. That’s what happens, I suppose, when you take American manufacturing for granite. With the way people seem to be getting worked up about American reliance on cheap goods from China, here’s a bit of free advice for Mitt Romney and President Obama: check your lapel flag pins, and if necessary, replace them with US-made pins. You’ll thank me for it.